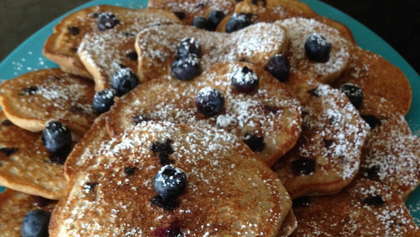 Try these fluffy blueberry pancakes hot off the griddle. It tastes just like how Grandma used to make them! Preheat pancake griddle to 350 degrees. Whip wet ingredients in a medium bowl. Drop by large spoonful onto buttered grill. Flip when first side is lightly browned and batter is bubbling slightly about 1 minute. Flip, brown the second side, and move to a platter to stack. Dust pancakes with powdered sugar.